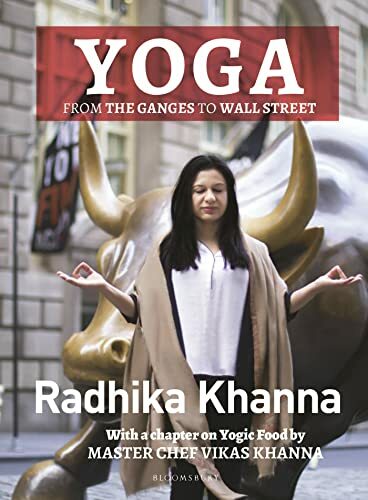 Author Radhika Khanna, a New York fashion designer who was born and raised in India, has a unique relationship with yoga. While working in the fashion industry, she was diagnosed with lupus. In search of a means to manage this chronic illness, she returned to her home country, where she studied various types of yoga; she eventually trained as a yoga teacher in Canada. Khanna released a previous work, Pose: Yoga for Working Professionals, a guidebook of short, simple yogic techniques providing benefits in the workplace. On its back cover, Khanna's second book Yoga: From the Ganges to Wall Street is deemed "an encylopaedia [sic] on wholesome living." Upon initial perusal, it appears somewhat like a coffee table-style book, although not quite as large: it is heavy, with thick pages, glossy photographs (of the requisite yoga postures but also of other aspects of Indian culture, including artifacts, architecture, and food), and, with the exception of the first fifty or so pages, somewhat minimal text. Yet the content is fairly substantial. Khanna begins with a section on the history of yoga, starting with yoga's earliest known origins, moving through the Vedic, Pre-Classical, and Classical periods, and continuing through to a reasonably comprehensible overview of today's yoga lineages. The author makes some odd choices—e.g., spending over a page on the history on Patanjali but less than that on the Yoga Sutras themselves—but still, Khanna provides useful knowledge overall. Khanna then moves on to a discussion of yoga asana, or poses. At approximately 100 pages, this is the bulk of the book, mainly presented as a "Seven-day Yoga Practice." Here Khanna presents an overview a weekly routine, which includes a theme for each day of the week (e.g., Monday = Standing Poses) and 4-8 postures for practice. The individual poses are broken down well: each is featured in a 2-page illustrated spread that includes step-by-step instructions, benefits, and anatomical focus. The idea behind this is excellent, but the posture choice is irresponsible. Tuesday includes Lotus pose, an advanced seated posture/hip opener that could easily cause damage to the hips, knees, feet, or ankles for an inexperienced yogi. The first posture for Wednesday is Wheel pose, an intermediate-to-advanced back bend which requires preparatory work (none is shown). And both Thursday and Friday include poses that are generally recommended to be performed with the guidance of an experienced teacher, including Peacock pose, Headstand, and Shoulderstand. At the start of the posture segment, Khanna does note "when in doubt, always refer to a yoga teacher" (p. 62), but otherwise, she does not offer any cautions or modifications. A chapter on meditation follows. Although this is brief, Khanna describes several distinctive techniques, and it is a refreshing reminder that yoga is more than asana. The next section on "Yoga for Professionals" appears to be quite similar to Khanna's previous book, as many of the headings are exactly the same (such as "Eye Defender," "Effective Meetings," and "Pain in the Neck"). Again, these are practical methods for incorporating yoga strategies into the workplace. Khanna's final contribution to the book is a section on naturopathy, with a focus specifically on aromatherapy. She suggests essential oils that can be helpful as part of a holistic approach for conditions such as depression, anxiety, headaches, stress, and insomnia. The last section on "Yogic Food" is presented by Master Chef Vikas Khanna, the older brother of the author. V. Khanna first reviews the spices most commonly used in Indian cooking and their benefits. He then presents recipes ranging from beverages to breakfasts to main dishes. Each recipe is featured in a 2-page spread with a full-color photo, list of ingredients, simple instructions, a total servings. I was intrigued by the "Warm Comforting Apple and Vegetable Soup," which includes onions, apples, carrots, and ginger. There are also many versions of dal, a classic Indian dish. This final chapter is the second-longest at just over 70 pages. In the end, I think this book might have the most appeal for those wanting to dabble in yoga, including the practice, history, and traditions associated with it. More serious students like myself (I've practiced since 2001 and completed a teacher training in 2015) may find that Yoga: From the Ganges to Wall Street has less to offer them.